A. Twinanda, S. Shehata, D. Mutter, J. Marescaux, M. de Mathelin, N. Padoy. EndoNet: A Deep Architecture for Recognition Tasks on Laparoscopic Videos, IEEE Transactions on Medical Imaging, Institute of Electrical and Electronics Engineers (IEEE), pp. 86-97, 2017. A. Twinanda, E. Alkan, A. Gangi, M. de Mathelin, N. Padoy. Data-driven spatio-temporal RGBD feature encoding for action recognition in operating rooms, International Journal of Computer Assisted Radiology and Surgery, Springer-Verlag, Vol. 10(6):737-747, juin 2015. A. Twinanda, J. Marescaux, M. de Mathelin, N. Padoy. 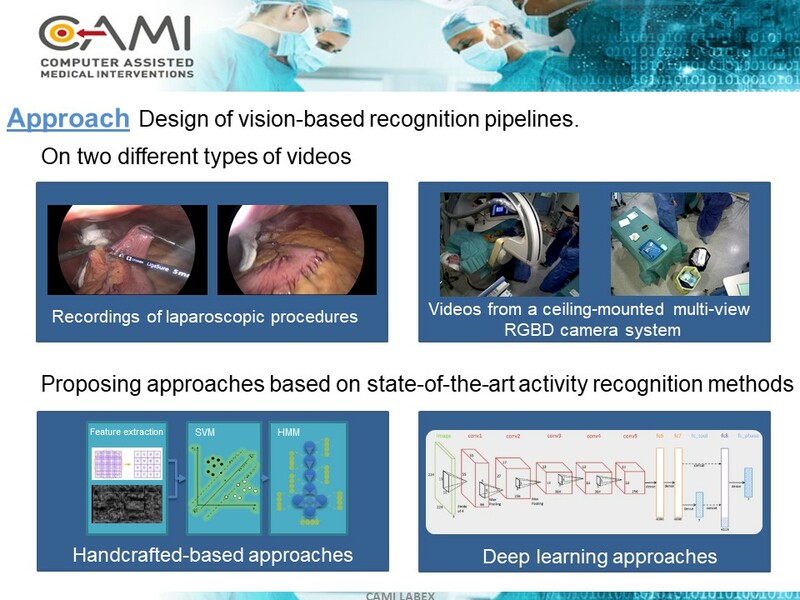 Classification approach for automatic laparoscopic video database organization, International Journal of Computer Assisted Radiology and Surgery, Springer-Verlag, Vol. 10(9):1449-1460, 2015. I. Aksamentov, A. Twinanda, D. Mutter, J. Marescaux, N. Padoy. Deep Neural Networks Predict Remaining Surgery Duration from Cholecystectomy Videos, dans International Conference on Medical Image Computing and Computer-Assisted Intervention (MICCAI), Quebec, Canada, janvier 2017. A. Twinanda, M. de Mathelin, N. Padoy. 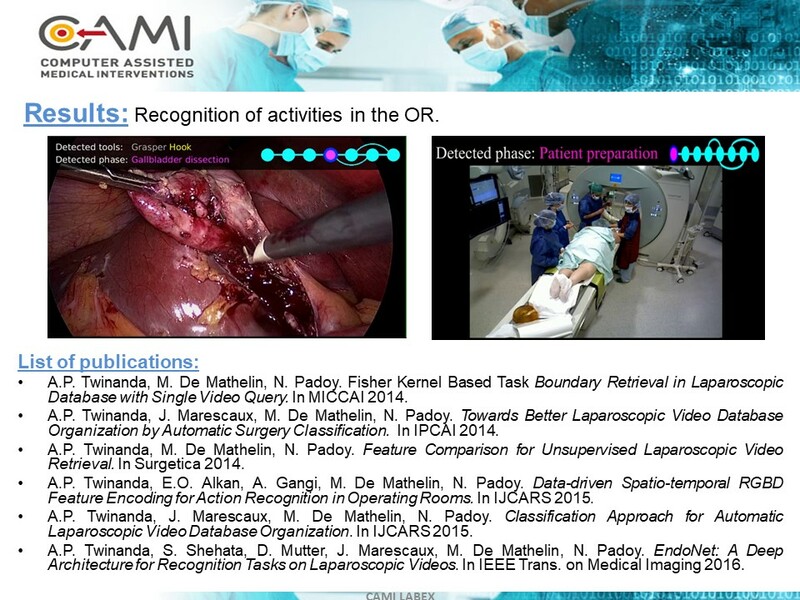 Fisher Kernel Based Task Boundary Retrieval in Laparoscopic Database with Single Video Query, dans International Conference on Medical Image Computing and Computer-Assisted Intervention (MICCAI), Lecture Notes in Computer Science, Vol. 8675:409-416, Boston, United States, septembre 2014. A. Twinanda, J. Marescaux, M. de Mathelin, N. Padoy. 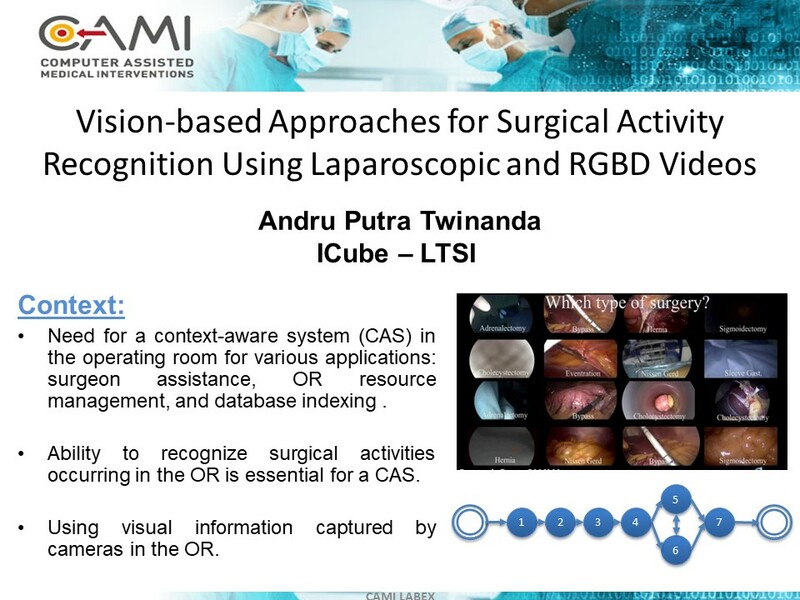 Towards Better Laparoscopic Video Database Organization by Automatic Surgery Classification, dans International Conference on Information Processing in Computer-Assisted Interventions (IPCAI), Lecture Notes in Computer Science, Vol. 8498:186-195, Fukuoka, Japan, juin 2014.